In August (2013) we were asked to assist with a young abandoned pet dog named Benji who had the misfortune to be taken to a pound in the Nottingham/Derbyshire area having been found roaming on his own. Benji was thought to be under a year old and his previous owner had mistakenly listed his breed type as pit bull on his microchip details. 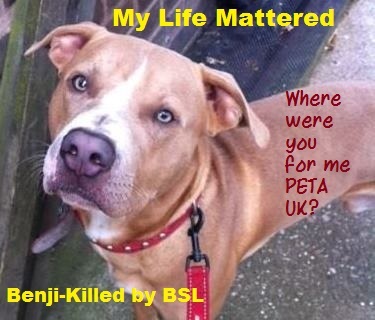 Benji's story is too long and complicated to address fully here, however we can say that during the space of a few weeks we tried very hard, along with a caring rescuer, to save Benji's life when he was caught in the cruel and unfair enforcement of BSL. Benji was offered a safe rescue placement and in fact he was also offered a permanent home with the rescuer who offered to adopt him. As Benji had been labelled pit bull on his microchip details, he came to the attention of the authorities and therefore the only way to dispel this 'dangerous' label was to assist the rescuer by helping to provide an independent breed identification assessment report to ascertain if he was indeed of prohibited type. An independent breed identification assessment was carried out on 20th August by an expert and DDA Watch covered the cost of the assessment in order to establish whether Benji was a prohibited type. The expert's opinion of Benji stated that Benji, Quote: 'Quite simply lacks the physical presence required of a pit bull. Benji is far too narrow in the chest; he should also have a wide strong rear end supporting musculature. He is underweight at present but in my opinion, adding weight and musculature through training will not compensate for the lack of skeletal conformity with the ADBA standard. His head appears to resemble that of a Labrador. It may be that he has some bull breed within his ancestry, but it is insufficiently shown to meet the ADBA standard. On Friday 23rd August, the day before Benji was due to start his new, happy life when he was to be adopted with rescue back up out of the pound, police seized him as a potential banned breed 'type'. We sent a copy of the independent breed id report to the dog legislation officers involved and liaised with them regarding a possible future for young Benji. We were informed via email on 6th September that Benji, on advice from the Nottinghamshire police legal team (who had apparently considered the case) had been put to sleep. Benji had never done anything wrong. He was just a stray dog like many others. Those who had come into contact with him said he was gentle and friendly. He would have made a wonderful companion pet to the rescuer who tried so hard to save him. Benji deserved a life, a future, a family, he deserved to be taken care of, to have enough to eat, to have a nice cosy bed to lie in, and he deserved a chance. We don't know how long Benji had roamed by himself but he caused no trouble doing so, he was just searching for someone to love him. Benji didn't ask for much in life and he received so little kindness save for a few people who desperately wanted him to have the chance to become a healthy, happy dog with a home of his own. Now he is gone forever. Killed by BSL. Benji will never know what it would be like to be loved unconditionally and to enjoy the fun of being cared for, to play ball, to be cherished and be part of his own family. Rest in peace lovely lad. You deserved so much better. Run free now and make friends at the bridge.